Wedding Season is upon us, and many Staten Island Brides are wondering what to wear for their upcoming 2016 Wedding. 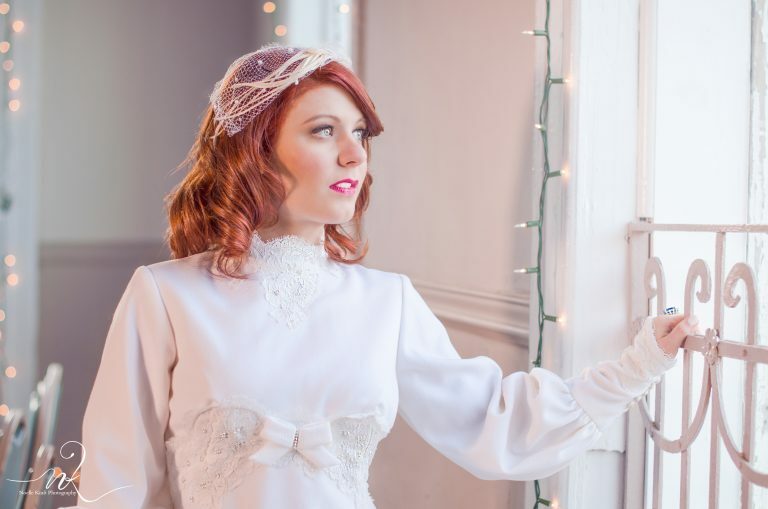 We looked through many Staten Island Bridal Boutiques, to select dresses that fit the styles that walked down the Runway for the 2016 Spring/Summer collections last year. We found that there are seven distinct trends that are going to define 2016’s Bridal Fashions. Below is our list of seven bridal trends for 2016 and where to find them on the North Shore of Staten Island. In no particular order, let us begin. Long sleeved dresses first came back into being trendy when Kate Middleton wore her long-sleeved, lace gown for her April 2011 wedding. Since then, women have once again embraced sleeves. This gown below, is provided by Monkey Girlz Boutique, a consignment shop located on Manor Road. This dress is from the 1970s, but has the modern-day touches that brides wear today. The dress is also tea length and has satin buttons along the wrist and all along the back of this dress. The Deep V is great for accentuating a woman’s natural curves and for showing off some skin. This dress is from Always a Bridesmaid, and is from their Maggie Sottero collection. We love how the pale pink ribbon accentuates this models’ waist, making her to appear taller and leaner. We also love the lace detailing along the Deep V to further accentuate it. Laser cut florals have been a growing trend over the past few years. This gown from Emily’s, is a perfect combination of the emerging sheer trend and the laser cut florals. More wedding gowns are becoming sheerer and sheerer, however, they are offering more intricate ways of carefully providing modesty. This gown is by Jovani, and is perfect for a bride who wants to wear this trend in a more conservative manner. Women always strive to show off their best assets; their forearms, legs, and of course, their back. 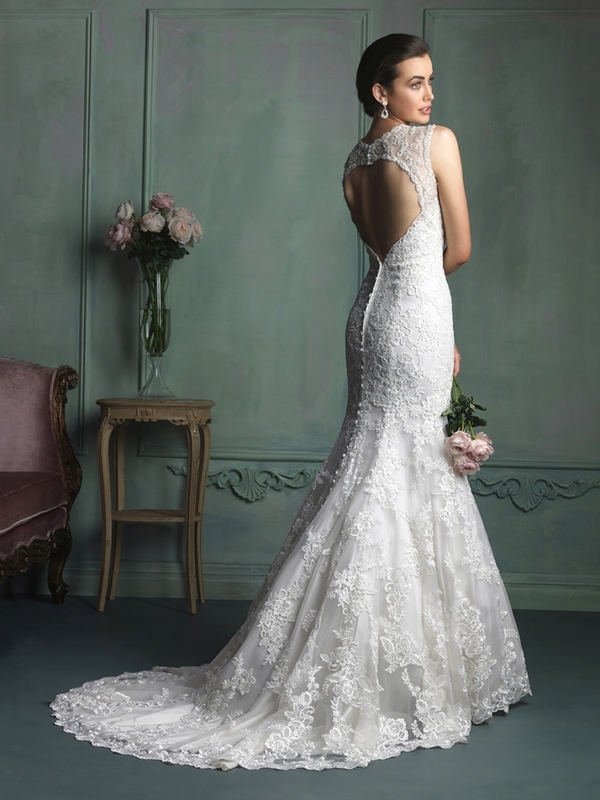 This gown by Allure is offered through Angel’s Bridal. The gown has a lovely heart shape on the back as it draws attention and drama as it draws the eye upwards towards bride’s best asset of all, her smile. Colors such as silver, blush pink, ice blue, champagne, and rose gold are once again going to be huge this season. 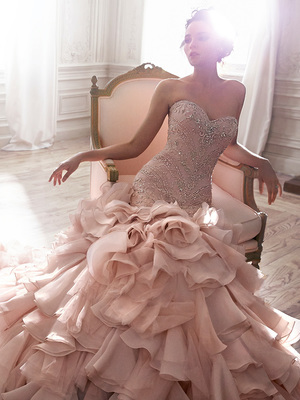 This gown designed by Maggie Sottero, offered by Bridal VIP, is in a lovely blush pink. The dress also features one of the biggest trends of the year, a corset bodice. Fringe first became popular in the 1920s, and has since made a come back . This dress is from Bossina Couture, located in New Dorp. The gown is from her Rosa Clara collection. We love how this gown isn’t a literal interpretation of the 1920s fringe, but a transformation of it for the modern day woman. Tea Length dresses were first made popular in 1957 by none other then Audrey Hepburn in her leading role of Jo Stockton in Funny Face. 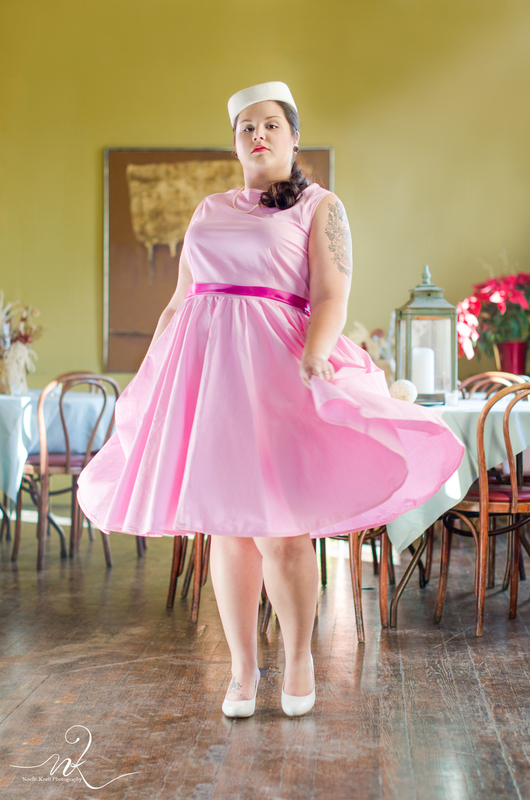 This dress is from Hey Viv!, a boutique specializing in clothing from the 1940s and 1950s. We hope this list makes the daunting task of finding wedding dresses for your Staten Island wedding easier. And a special thank you to Noelle Kraft Photography for the photos she provided for Hey Viv! and Monkey Girlz. You can view the full photo shoot, by clicking here. I am a 24 year old fashion blogger from the Poconos who has finally made the move to the big city... sort of. Living on the Forgotten Borough has its perks though, there are some great local fashion spots, and a budding fashion community right here in our backyard. And a quick hop on the ferry brings us all of the inspiration we need. If you have a fashion tip or a lead on a fashion event, send me an e-mail at Alexandra.M.Nyman@gmail.com.